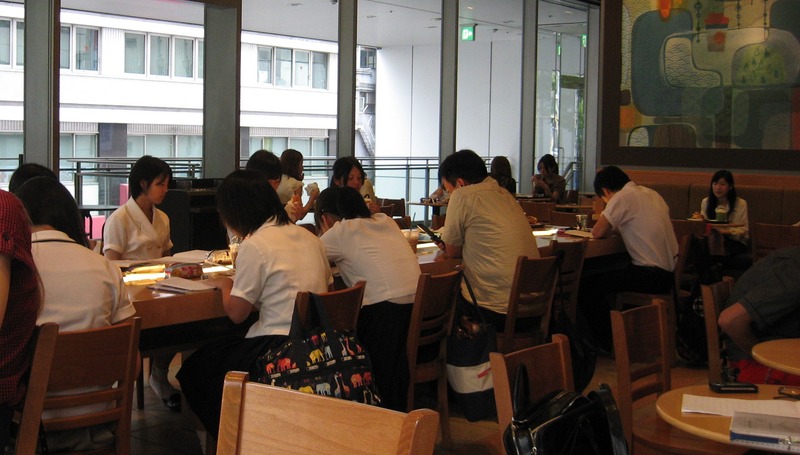 Since Starbucks has been fueling my JLPT (see previous post) cramming efforts for a few days now, it seemed like the right time to write something about Starbucks in Japan. In Belgium I wouldn’t be caught dead in a Starbucks since there are so many nice and locally owned coffee bars. Besides, there are only 3 Starbucks in Belgium. But in Japan, if you feel like having a decent cup of coffee, Starbucks is as good as it’s gonna get. And I have to admit that despite my initial scepticism, I have become a fan. The atmosphere in Starbucks is nice. The cozy feel is even more appealing now that it is getting colder. In addition to that, the coffee is quite good, though a bit expensive for European standards (but reasonably priced for Japanese standards). And it is a popular place to study among young and old alike. Surrounded by a bunch of studying high-school students and with a warm mug (I love that it’s a mug instead of a cup) of delicious energizing coffee in front of me, I memorize Japanese vocabulary at an unseen speed. Let’s hope my caffeine overdoses pay-off at Sunday’s exam. Starbucks in Toyota City is in the Matsuzakaya building near the train stations ‘Shintoyota’ and ‘Toyotashi’. My recommendations: Caffe Latte or Chai Tea Latte. This entry was posted in Japan, Restaurant reviews and tagged Coffee, Food and drinks, Impressions of daily life, Toyota City by Haruko-chan. Bookmark the permalink. All the best with your exam!! And good on you for still blogging even though you are busy studying! 🙂 Gambatte ne! That’s interesting that all these high school students are there. Generally speaking and as you know, Starbucks is on the high end as far as fast food goes and their customers tend to be older. And for high school kids I don’t know how much brand coffees mean to them. Maybe they were studying behaviors of Starbucks customers as their social studies topic?! Haha, could be. Although they hardly lifted their heads from their books, so I don’t know how much human behaviour they could actually observe. I usually see them drinking the more softdrink-like coffees like frappuccino (the ones that come with a straw). I am crossing my fingers for you. Gooooood luck on your exam!!!!! Merci! Ik zal laten weten hoe het afloopt.